They are indeed. 75cl bottles are considerably dearer. This price is for the single glass size not the 75cl I'm afraid! The title says 75cl so full bottles but when you select options it's the price for the single glass version. 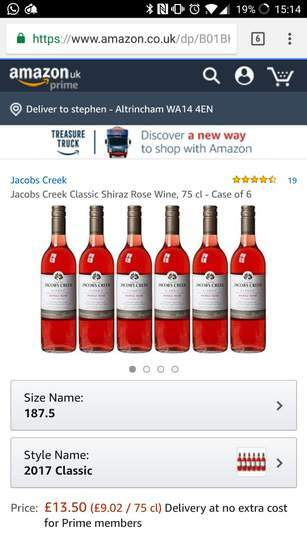 if they are not as described and description clearly said 6x75cl bottles shipping weight 7.7k you will get a refund from amazon or a replacement. Shame there's no reviews. There is this picture and it says 1122ml so, not sure what to think! No it doesn't the title does but it clearly has the option of what size …No it doesn't the title does but it clearly has the option of what size your picking so why you being dumb? Think outside the box. 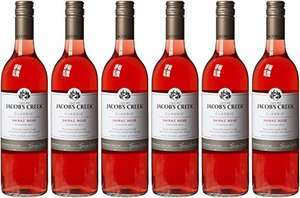 This is an opportunity to get a few litres of wine delivered to your door for free - including Scotland. Ta OP - ordered a few. Yes this applys to the 75cl option I don't understand how you aren't getting the listing it's not that hard? Think outside the box. This is an opportunity to get a few litres of wine …Think outside the box. This is an opportunity to get a few litres of wine delivered to your door for free - including Scotland. Ta OP - ordered a few. 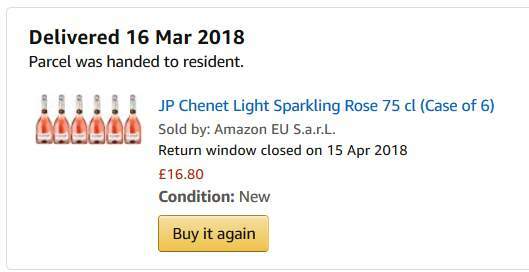 There are quite a few on "Customers Who Viewed This Item Also Viewed" that say 75cl...one of which, the JP Chenet Light Sparkling Rose (on the left) I ordered a few months back and was 6 full size 750ml bottles. 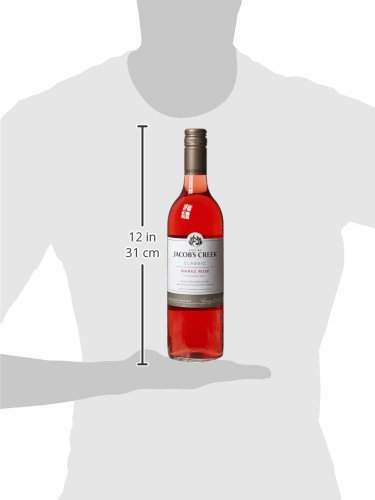 So have we come to a conclusion  are these small bottles or standard size wine bottles? So have we come to a conclusion  are these small bottles or standard …So have we come to a conclusion  are these small bottles or standard size wine bottles? i have screenshots and email receipt that will be enough to either get me a refund and keep the bottles or get the correct sizing.it is up to anyone else if they wish to take a chance.i am not here to be abused be called moron idiot or anything.i spend my free time putting deals on here. Think ill cancel my order then. 5.5% ABV!! This stuff has double the amount. And how many of them have the option to change to smaller bottles and has the smaller bottles in the description. Got confirmation email too for 6 75cl bottles so fingers crossed. i have screenshots and email receipt that will be enough to either get me …i have screenshots and email receipt that will be enough to either get me a refund and keep the bottles or get the correct sizing.it is up to anyone else if they wish to take a chance.i am not here to be abused be called moron idiot or anything.i spend my free time putting deals on here. I agree with you. HUKD can be like the wild west compared to other forums I frequent...you can express a difference of opinion without making it personal. Some of the comments and behaviour on here is unbelievable..though I think mods are getting a bit tougher. Edit: Anyway, with Amazon, you have nothing to lose, you're not lumbered with it like you would with an ebay seller (or at least you'd need to put up a fight). Get on Live Chat and let them know. They'll either tell you to keep it, return it, and probably offer £5 for the inconvenience - if they muck up and send the teeny-tiny bottles, that is. I have ordered 6 times and got full size bottles each time. I'm a woman, which pair are you referring to? I'll let you know if I defy …I'm a woman, which pair are you referring to? I'll let you know if I defy biology any time soon. Ah, I didn't see the drop-down selector at the top people are referring to. 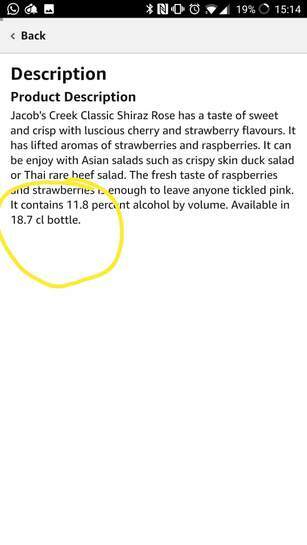 It is a bit confusing as the description/illustration/quoted weight all imply it's full-size bottles. I think I'll hang on in there, anyway. The new Firefox screenshot option has made me screengrab-crazy, haha. 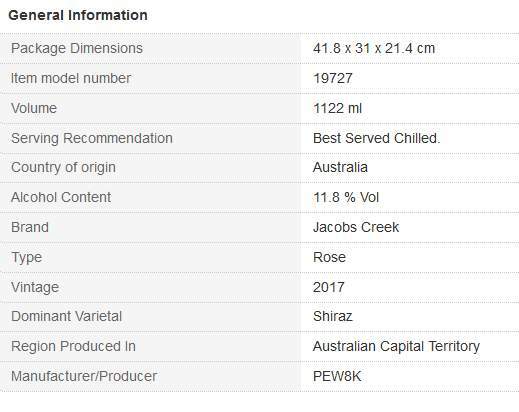 If you look at the Technical Details section on the listing, it states the Volume is 1122ml. Its close enough to the 187.5ml bottle size equation for me to not bother ordering but good luck to those that do !